A “Spirit of Mother Jones” window display is the highlight of Cork’s main tourist office on the city’s Grand parade this week. 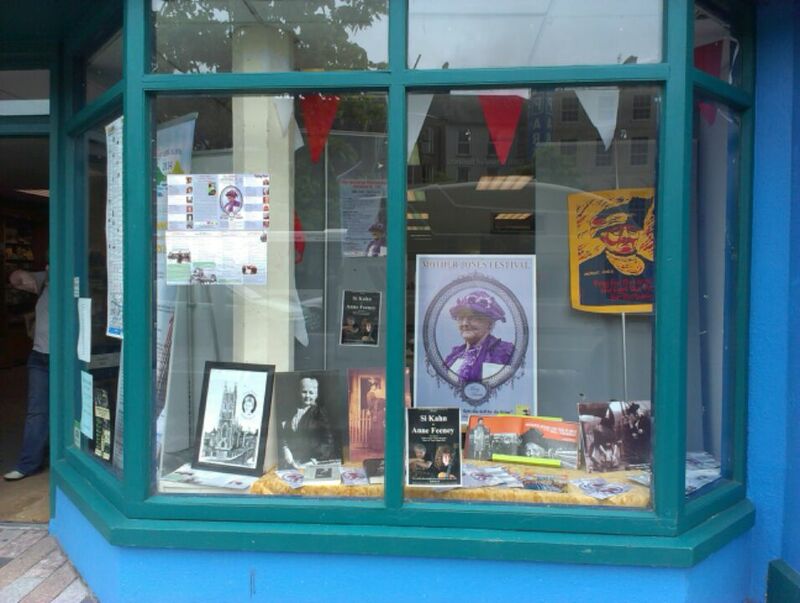 The display highlights the life and work of Mother Jones, her Cork birthplace and promotes the Spirit of Mother Jones Festival which begins in the historic Shandon district next week on Tuesday, 29th July. In addition to the Tourist Office display in the city centre, the Shandon area is en fete currently with colourful bunting and is awash with flowers with hanging baskets and floral displays while a number of local business premises also feature Mother Jones posters. Our sincere thanks to the Shandon Area Resident’s Assocation, Fáilte Ireland, the staff of the Cork Tourist office and especially to Mother Jones committee members James Nolan for his work with the Shandon displays and Ailbhe Mahony who put together the tourist office display. The festival also features prominently on Cork City Council’s website and in local media. Cork, and Shandon in particular, can take a bow. Mother Jones would be impressed.